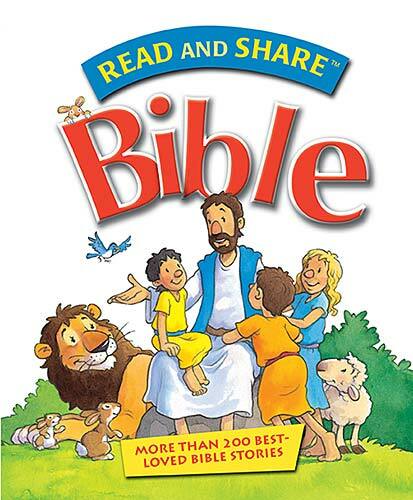 The Read and Share Bible is perfect for younger children just learning Bible stories. The illustrations are colorful and simple enough to tell the stories without overwhelming children. The language used is also clear so that even three year olds are able to follow the lesson and most importantly understand it. Each story comes with a question that will give you time to talk with your child to discuss the story into even more detail as well as giving them time to ask questions. If there are still questions don't worry each story gives you the chapter and verse to go to for the complete story. Right now Amazon is selling the Read and Share Bible for only $5.93, but you better hurry we all know how fast things sell out and prices can change on Amazon! Would you like to win a copy of Thomas Nelson's Read and Share Bible? Why do you want to win a copy of Read and Share Bible ? Visit Thomas Nelson and watch the Read and Share Video, what do you like? Thanks to Thomas Nelson for my Read & Share Bible and for the winners, my opinions are my own. No money was received for this post. So after reading your "for those entering giveaways" helpful advice post. Do I have to do all of the rules to enter? I'd like to give this to my DIL's nephew. His dad is a minister. I like the way it tells the stories in a way children can understand. even though my oldest can read for himself, this would give him & his younger brother something to watch together so we can learn as a family. I'd like to win this so I can share the bible stories with my children. I would love to win this for my great grandchildren who my daughter are adopting. I am putting together a Love Chest for a friend's baby soon to be born (P.S. Love chest is like Hope Chest but for a baby!). This would be a perfect addition! Thanks for the review! It's most helpful, as we are always trying to find new ideas to get the Word into our children's lives. Wanted to share something with you that we were introduced to over the holidays. Think you may enjoy it! Children's Bible is an app designed for children 3-13 & shares Bible stories through comics. It is available for most smart phones & computers. We have found this is a great way to get our children in the habit of reading the Bible, & it's on their level. They have really enjoyed it & we are thrilled at their excitement with the Word. Just something we have found that works & wanted to pass along - check it out at childrenbible.org - Thanks for all you share! I would love to win a copy to share with the kids. Sounds like a great way to share God's messages with children! I want this for the littlest one, Bible stories should be familar stories from the beginning to the end of our lives. We just started attending church with our boys and are trying to explain some of the stories to them but have a hard time explaining it in ways they could understand. This would be a great tool that I think we would all enjoy. I would like to have it for my granddaughter. Much better watching these stories than cartoons. With the read and share video...I really like the man's voice that is narrating it. It is so clear and reads slowly for the children to comprehend it. subscriber of "My Springfield Mommy"
We are a Christian family and I love to read and want to encourage that in the little ones in our family as well. Said I like you oN FB. I would like the story of the Flood.